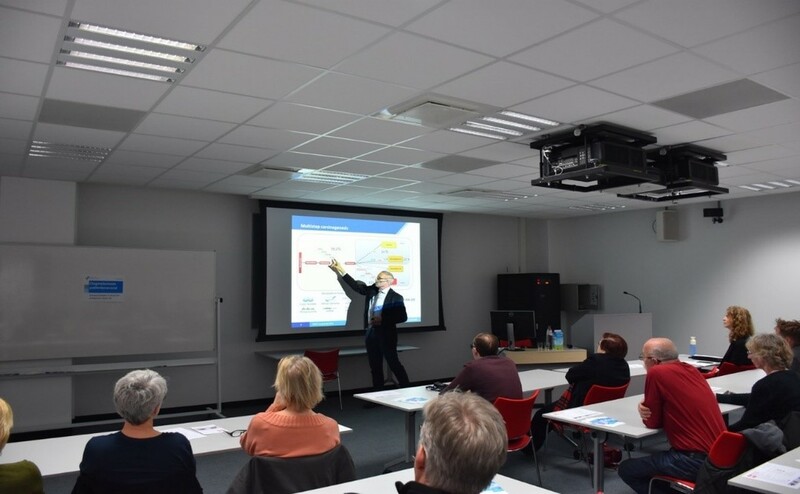 On 15th February, a Patient Information Evening took place at The Leiden University Medical Center (LUMC), in Leiden, The Netherlands. 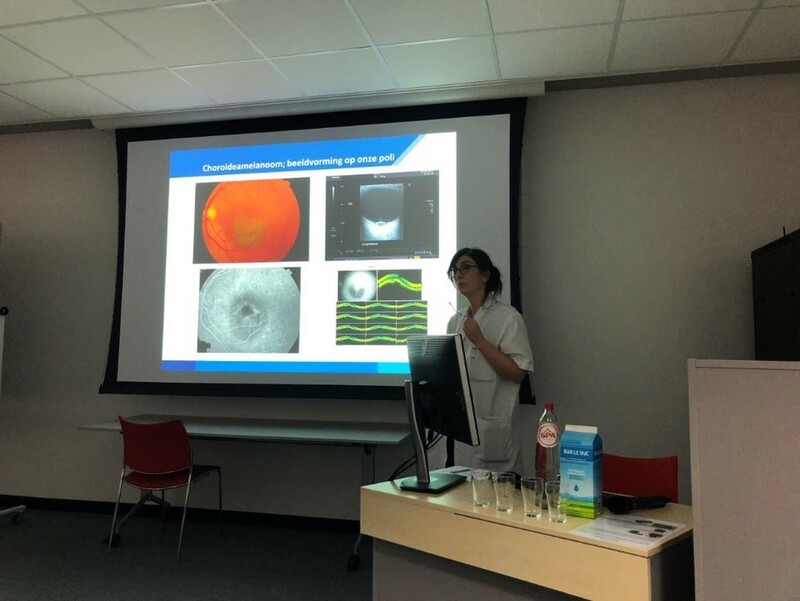 This event, intended for patients diagnosed with a Uveal Melanoma (UM), their partner and/or relatives, was an evening session on the topic of UM and specifically research that is done in the LUMC department of Ophthalmology related to it. 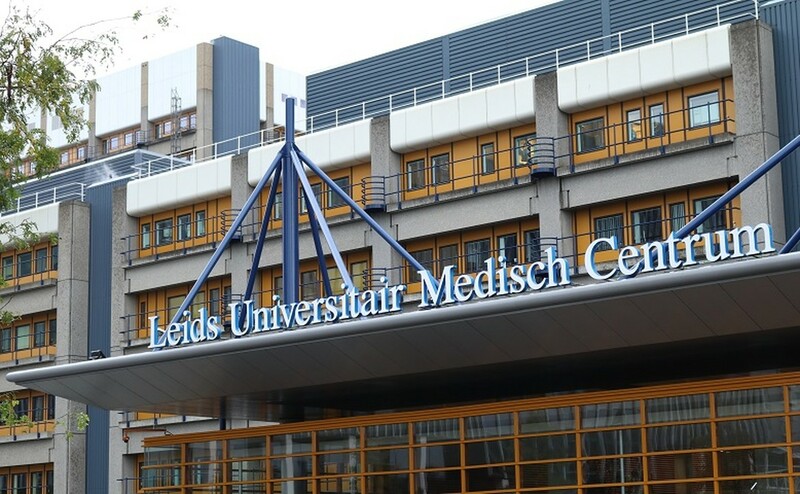 The patient organization “Stichting Melanoom”, representing Uveal Melanoma (UM) patients, was also invited, as well as nurses from the LUMC clinic, who are actively involved in the care of this specific patient group. The evening started with several lectures presented by professors Dr. G.P.M. Luyten, Head of the Ophthalmology Department, Dr. Martine Jager, vice-chairman of the MD examination committee at the LUMC, Dr. Marina Marinkovic, an ophthalmologist specialized in ocular oncology, Rogier Nell, a laboratory PhD, and Jacqueline Franken, representative of the “Stichting Melanoom” patient organization. Prof. Dr. G.P.M. 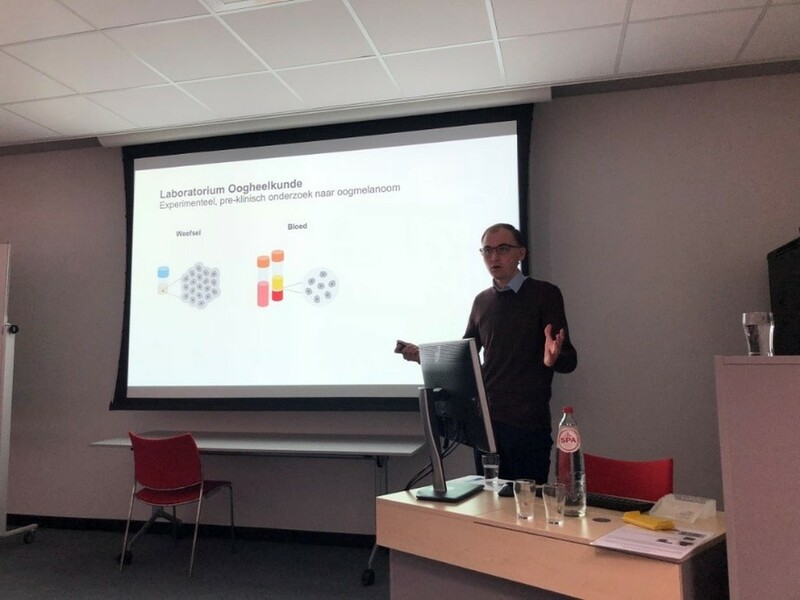 Luyten presented the very new topic of the BAP1 mutation and its role for UM followed by Prof. Dr. Martine Jager who explained the importance of the UM Cure 2020 Consortium, focusing on development of new treatments for the metastatic uveal melanoma. Rogier Nell gave an introduction about the biological features of a tumour, the constitution of both healthy and unhealthy cells, followed by an insight into the research technique of dPCR analysis and how this will help with getting more information about tumour cells. Dr. M. Marinkovic made a presentation about proton beam therapy. The closing lecture was given by Jacqueline Franken, presenting the “Stichting Melanoom” organization, all its the activities, how they can help patients cope with their diagnosis and their efforts to be present in ocular melanoma national and international meetings and conferences to report back to their patient group. Prof. Dr. G.P.M. Luyten, Head of the Ophthalmology Department, during his presentation on BAP1 mutations. 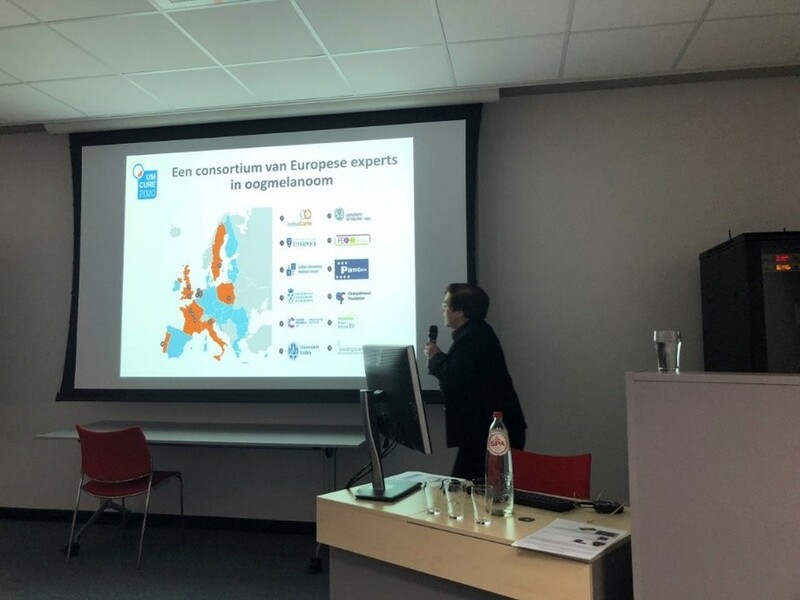 Prof. Dr. Martine Jager, vice-chairman of the MD examination committee at the Leiden University Medical Center, presenting the UM Cure 2020 project. Rogier Nell, a laboratory PhD, presentating research techniques. Dr. Marina Marinkovic, ophthalmologist specialized in ocular oncology, presenting the proton beam therapy. Jacqueline Franken, the patient representative, presenting the “Stichting Melanoom” organization. After the lectures the attendees were given a tour over the different laboratories and culture labs of the department of Ophthalmology. The tour included information about equipment, specific machines and lab tools but also involved observing different cell lines in culture flasks under the microscope and stained sections from different tissues. 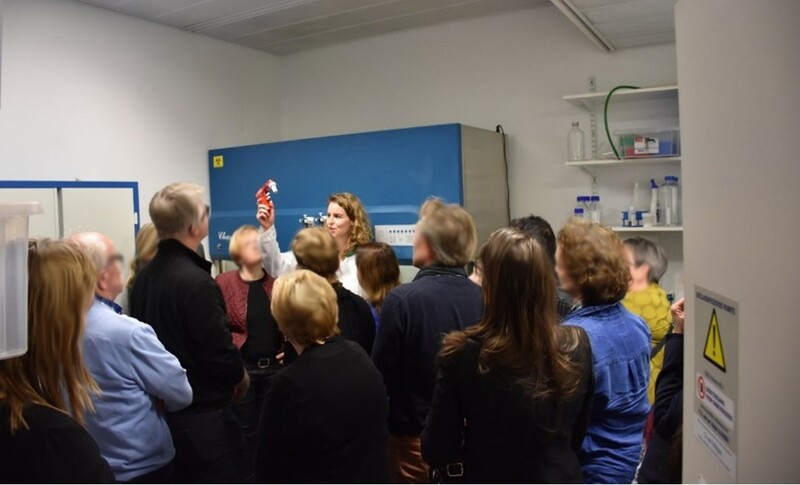 Dr. Annemijn Wierenga, a PhD candidate at LUMC, the session organizer, giving an explanation about different materials and equipment needed to culture cells, during a lab tour. 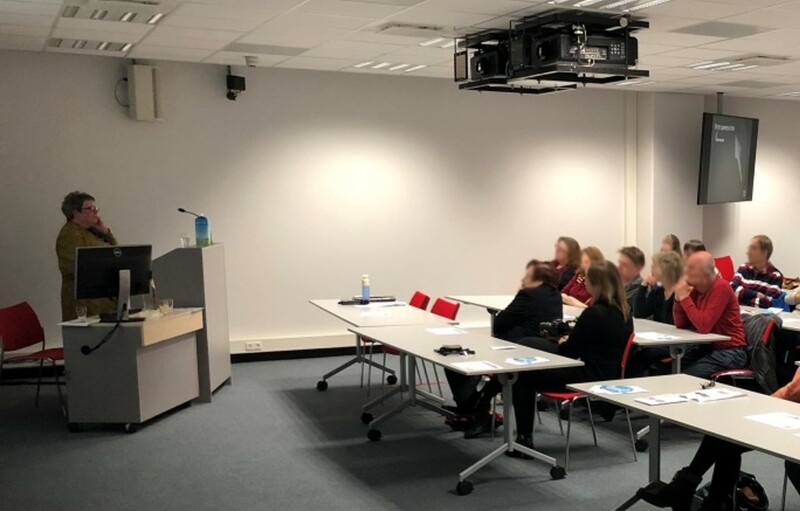 Organized by Dr. Annemijn Wierenga, a PhD candidate at LUMC, this Patient Information Evening was a very interesting session, with a lot of positive feedback from both patients and doctors.